Compact fluorescent lamps are quite popular these days. They can offer more light for less power when compared to standard incandescent lamps. When made by quality companies, they can also outlast standard lamps. But, many of the lamps coming out of China are poorly made. Very few of the lamps I have purchased lately have lasted more than two years, even when the package says that the lamp would last 5 years. I’m sure many of you have had similar experiences. 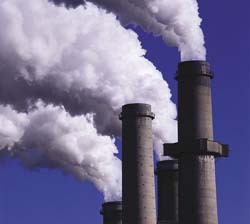 About three decades ago I was working for a company which manufactured and installed complex systems that measured the pollutants belched out from utility size smokestacks in large coal fired power plants. These probes were mounted toward the top of the stack and measured, temperature, gas flow, particulates, oxygen, sulfur dioxide and nitric oxides. These measurements were required by the US environmental protection agency (EPA) and had to be continuously reported to the agency. I was assigned the task of designing and building a new monitor, which measured ammonia gas. The new probe had been carefully checked out back in Denver. It fit into the standard probe housing, which had already been prepared on one of the smokestacks of the large New Mexico power plant. Although it was not my normal job assignment, I was asked by the field service department to look into why another bank of instruments in another smokestack at the same power plant had stopped working. It only took a couple hours to install the new probe and verify its operation. The main computer collecting the information printed out a good stream of data from the new probe. I then gathered my tool box and headed over to the main control box at the foot of the smokestack not working. Another engineer, much older and wiser than I, helped me open the heavy stainless steel enclosure, which housed the signal conditioning and data conversion circuits for the probes assigned to that smoke stack. When we finally opened up the tightly sealed enclosure, I was greeted with a gush of dirty water, which spilled onto my shirt, pants and shoes. I looked at him in complete puzzlement. How did water get into a weather proof enclosure? He looked at me and said “vapor pumping.” Vapor pumping, what was that? He explained to me how even a small break in the tight seal could slowly push air laden with water into the enclosure, which would condense and collect at the bottom of the enclosure. The condensation would then produce a lower pressure inside the enclosure, which would draw in even more air. 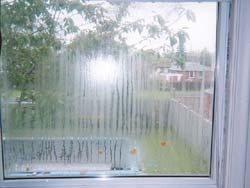 He said that this is often seen as condensation inside dual pane windows, when the seal between the two sheets of glass had failed. In this case, so much water had collected in the steel enclosure that it shorted out the signals attached to the many terminal blocks on the bottom of the circuit boards. Our solution was to first clean up the inside of the enclosure of all the water. 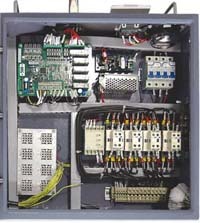 We then replaced the circuit boards with replacement units we had brought with us from Denver. We also borrowed an electric drill and drilled a small hole at each of the four bottom corners of the enclosure. These “weep holes” would prevent any more water from accumulating in the bottom of the box, by letting it drain out. After a couple hours of work, we buttoned everything up and went back to the main control center to make sure that the smokestack signals were running again. They were. I never forget this incident. Sometimes it is better not to try to obtain a perfect Smokestack3.jpg tight seal. From then on weep holes and conformal coated circuit boards were the norm for any future control units.